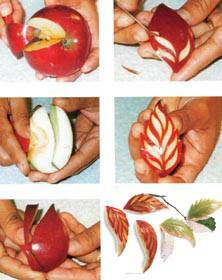 The purpose of fruit and vegetable carving is to make food more attractive, more appetizing, and also easier to eat. The accomplished homemaker welcomes her guests with fruit carefully pared, seeded, and perhaps cut into bite-size slices depending on the type. Vegetables are first delicately carved, then cooked, and finally arranged attractively to decorate the dish which they are part of. Needless to say, guests are greatly pleased to be honored with such a gracious welcome, displaying as it does the good feelings and willing hospitality of the maker. Decorating fresh, well-formed, and colorful fruits and vegetables through artistic carving is by no means difficult; all it takes is concentration. Starting out, there is no need for special carving knives; one sharp-pointed knife is enough to carve fruits and vegetables beautifully. The knife, however, must be sharp at all times, and so you should always have a small whetstone nearby. 1. Before carving, fruits and vegetables must be washed and cleaned thoroughly. 2. Use knives with stainless steel or bronze blades. Knives with ordinary steel blades will cause discoloration of fruits and vegetables. 3. Do not carve excessively so as to avoid waste and loss of nutritional value. 4. The designs carved should be appropriate for decorating a plate of food; thus, floral patterns are suitable, while figures of animals such as rats are not. 5. Vegetables to be dipped into sauces should be cut to appropriate sizes. 6. Vegetables chosen for carving should be appropriate to the dish in which they are to be used, and they should be vegetables which are resistant to wilting, such as carrots and Chinese radishes. 2. Cut a wedged-shape slice as in the picture. 3. Trim away any of the core, leaving the flesh and skin. 4. With the carving knife, cut the slice to the shape of a leaf. 5. With the tip of the knife, make curving grooves in the skin to represent the veins of the leaf. Work from the base of the leaf to the tip. 6. Cut notches along the edges of the leaf. 1. Wash the cucumbers. Cut into 3 sections. 2. Divide the circumference of each into 8 equal parts and then make cuts about 3mm deep between each part down the length of the section. 3. Slice beneath each part down the length almost to the base to separate it from the flesh, thus forming the 8 outer petals. 4. Trim the flesh to remove ridges and then divide into 8 parts as before to make the inner ring of petals. These should be centered between those of the outer ring. 5. 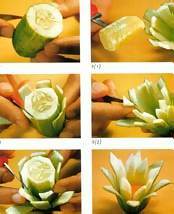 Remove the core of the cucumber, trim each petal so it tapers to a point, and then insert the center of the flower. Each kind of fruit and vegetable has its own unique characteristics, so keep these pointers in mind when choosing fruits and vegetables to carve. Onions and shallots should be fresh and without wrinkles. Choose either mediumsized or small bulbs that are all of uniform size. Carrots should be straight and of medium or large-size. Radishes should be fresh, firm, and round. Use medium-sized radishes, all of uniform size. Chinese radishes should be straight and of medium-size with clear bright skins. The flesh of large Chinese radishes tends to be mealy. Cucumbers should be green, straight, and of medium-size. The type called for in this book is the larger type (Tang Ran). If the smaller type (Tang Kwa) is used, those with green skins have firmer flesh and are better for carving than those with greenish white skins. Tomatoes should be of uniform size. Plum tomatoes, with elongated fruits, are firmer than round varieties. Choose fresh ones with no wrinkles. Pumpkins should have thick, firm flesh.Such pumpkins have a rough exterior. Spur chillies should be fresh and have firm skins. Generally small ones are used, because if large ones were cut and spread out to make a blossom, they would cover the entire plate. However, large spur chilies are used for making anthurium flowers. Spring shallots and leek should be fresh and green with no yellowing on the leaves. Select thick, medium-sized plants. Cabbage and Chinese cabbage should be fresh with firm, heavy heads. Use medium sized heads. Lemons should be very fresh. Taro should be of medium-size. The fragrant taro (Pheuak Hawm) has fine-textured flesh. Cantaloupes should be those that are not yet fully ripe. The skin should be pale yellow without wrinkles or scratches. Yam bean tubers used for carving should not be too large. Large, mature tubers have a lot of fibers. These become frayed in carving, detracting from the appearance of the finished work. Papayas should be straight, thick-fleshed and without any bruises. They should not yet be fully ripe so that the flesh is firm and does not bruise easily. The Khaek Dam variety is recommended be cause of thebeautifully colored flesh. Green mangoes should be fully mature and of a variety whose flesh is not too crisp. The skin should be green and un-wrinkled and the stem should look fresh. Watermelon should have red flesh and green rinds with no bruises or wrinkles. Pineapple should have large eyes. The leaves should be fresh and green and there should be no shrivelling of the skin or stem. Guavas should be those that are just becoming ripe. The skin should be a fresh light green skins and there should be no bruises or scratches. Apples should be fresh with glossy, brightly colored skins and no bruises. Jujubes should have straight fruits with green skins and no bruises. Sapodillas must be firm, so avoid fully ripe fruits. The skins should be even and clear. Avoid sapodillas that have been dyed for the market. Their skins have a dusty appearance. Rose-apples should have clear, fresh looking skins. 1. Tomatoes should be soaked in a mixture of lime juice and water to prevent browning. 2. Shallots and onions should be soaked in water before being peeled and carved to reduce irritation of the eyes. 3. Taro should be washed thoroughly before being peeled. If washed after peeling, a slime is released which causes itching. 4. Carrots should not be soaked in water before carving as this will make the flesh tougher and more difficult to carve. 5. Beets should be washed in water to which a little salt has been added. This will reduce loss of color. Also, if left standing, beets will blacken, so they should be kept moist by spraying them with water regularly. 6. Potatoes should be washed with water after peeling to remove the sap and then washed again after carving. This will help prevent browning. 7. Apples should be soaked in mixture of lime juice and water before being peeled to prevent browning. 8. Cantaloupes should be washed before carving. While carving, avoid letting water come into contact with the fruit because it will lose its taste and spoil more quickly. 9. Yam bean tubers should be soaked too long after carving, will yellow. 1. After carving, fruits and vegetables should be placed in ice cold water so the petals of flower designs are firm and spread beautifully. 2. Carved fruits and vegetables should not be left in water as this will cause petals to become discolored and to spoil. 3. Each type of carved fruit should be kept separately. This will prevent loss of all your work in the event that one type spoils. 4. Store carved fruits and vegetables by putting them in containers and placing in a refrigerator, or if no refrigerator is available, by covering them with a damp piece of thin white cloth and putting them in a place protected from drafts so they do not dry and wilt. 5. After carving, pumpkin should be dipped in water and removed right away. If left in water, flower petal designs will become bruised.